Auburn University graduate Andrew Odom, a Living Democracy Fellow who lived and worked in Old Cahawba/Selma in 2012, is now a law student at Faulkner University’s Jones School of Law in Montgomery. As I get ready to begin my second year of law school, I often think back to those smiling faces as they broke through the ribbon on bicycles at Old Cahawba a little over a year ago. I worked with a group of youngsters last summer to help launch the bike trail at Old Cahawba along with other inititiatives. The experience of reaching out and educating the students about life and community involvement taught me what we should all strive for as citizens: improved civic life and community involvement. Now, after a year of heavy legal study and some practical experience in the field of prosecution, my eyes are opened to just how crucial initiatives such as Living Democracy can be to our youth. Law student Andrew Odom in front of Alabama’s Capitol in Montgomery. I walked into a crowded Elmore County Courtroom one Tuesday morning this summer and saw many nervous faces awaiting their disposition. My eyes then focused on a face that was all too familiar. I nudged my supervising attorney and got a copy of the traffic docket, which included names of individuals charged with driving under the influence of alcohol among other violations. Then what I feared was the truth. A childhood friend had been charged with DUI. After the court duly sentenced him to jail time and court was adjourned, I thought about the different paths that my friend and I had taken in life. Bad decisions can multiply quickly. If there is not anyone for young people to turn to who can keep them accountable, those decisions can quickly encourage a recidivist culture and a life of crime. I became involved in a community building initiative called Youth Leadership Autauga County back in high school, a program similar to the project I later developed and completed in Selma with Living Democracy. 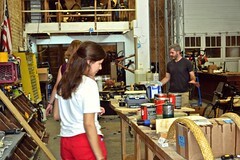 Each of these initiatives connected with young students in phenomenal ways. Each educates the students about the importance of community involvement and accountability and helps inspire them to pursue their goals and avoid the distractions that can lead to those dreams being thrown away. The Living Democracy Fellows and the students we worked with in communities across the state are fortunate enough to become involved in something that helps keep us on the right path, the path that will see our dreams fulfilled and our communities united. After spending this summer in the Elmore County District Attorney’s Office and the Attorney General’s Office working on various criminal matters in my hometown and state, it is very apparent that the real crimes I see on a day to day basis stem from the deterioration of the community and a breakdown in the family. Andrew Odom, center, plans bike trail launch for Old Cahawba with Jonathan Matthews and Linda Derry. As a law student, I do see stories of hope. I was able to see several juveniles get their lives back on the right path through the careful and dedicated work of their probation officers and juvenile programs. I believe communication is key to successful implementation of these programs, and communities must support troubled children after they have been in court instead of turning their backs on them. Living Democracy definitely showed me that a difference, no matter how small, can be made. The important thing is that this difference may start off small, but as people see positive change they are attracted to it. This appeal of civic revival can break down the hesitancy of isolated citizens to become actively involved in their community. I have seen it happen first hand. One of the lessons I carry with me today from my experience in the AU program is that we all have to strive to break down the apparent divide between government and the people so that our society can truly be a “Living” Democracy. You can read every book in the world about swimming, be able to identify every stroke, even know the physics that make it possible, but that knowledge isn’t what keeps you afloat in the water. It’s your instinct that keeps you from drowning. This summer, I’ve found that Living Democracy isn’t all that different from swimming. Before I arrived in Selma I thought I had it all figured out. I knew what my plan was and what I needed to do to complete it in 10 weeks. I’d read just about all there is to read on the internet about Selma and its history. I printed off every name, phone number, and email that I thought might be useful at some point. I prepared myself like I would for a big test, reading over things repeatedly, cramming information into word documents and writing down things to remember. I felt pretty prepared, like I was ready for the final exam on in my “Selma 1000” class. But all of the reading and studying and note taking in the world can’t prepare you for reality. Words can’t communicate everything there is to experience in life. I read about the Edmund Pettus Bridge on multiple occasions, but nothing that I read talked about how the sounds it made when cars drive over it or the how you can barely see the stoplight on the other side when you’re driving into town. The web sites I read didn’t tell me how many times I would introduce myself, and in some cases repeatedly introduce myself, to people. The books I scanned didn’t tell me about the awesome conversations I’d have in Wal-Mart about the benefits of gluten free diets and how to properly tie off stiches when crocheting a multicolored afghan (still haven’t mastered that one). All of the things that truly make a place what it is are things that you can’t read about or study for. The only way to prepare yourself is to experience it, and that’s what has made living in Selma such an adventure. Living Democracy in Selma has taught me a lot about how communities work and sometimes don’t work. 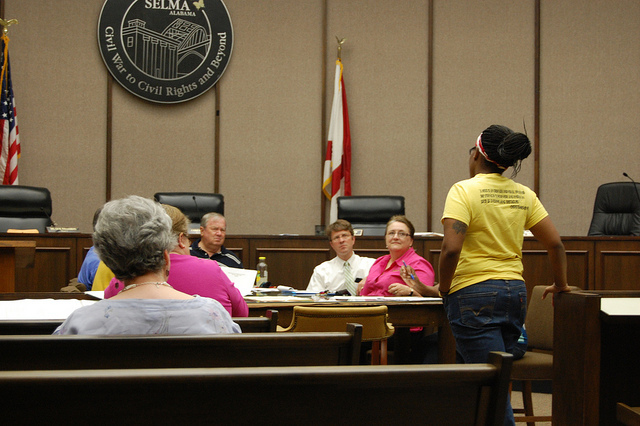 Like any other community in the country, Selma has its positive points and its negative points, but it’s how the citizens work to empower the positive things and improve the negative things that really shed light on what community is. It’s not always going to be a smooth process. People are going to disagree, mistakes are going to be made, and someone is always going to have a “better” way to do something. But when it’s all said and done, the fact that there are disagreements and mistakes means that people care and are trying to make their community better. That empathy alone is something that some communities can’t cultivate in their citizens. Coming from a hometown in a totally different region with totally different concerns, it’s amazing to see that Selma has people who care and work just as hard, if not harder, under different and more difficult circumstances. I don’t know that I could truly have understood these things before coming to Selma. I could have read about them, I could have had a discussion in a class about them, but nothing compared to seeing them first hand. And that is what makes Living Democracy here, and in any other community, so important. Some things can be taught, other things have to be discovered. They have to be experienced. And giving students the opportunity to get out and experience these things is what makes good, engaged citizens in the future. Having been here for most of the summer, I feel like I have just now gotten the hang of things. I don’t turn down the wrong streets anymore, and I can maybe even recommend a restaurant or two for you to try, but I definitely wouldn’t go so far as to say I know Selma. 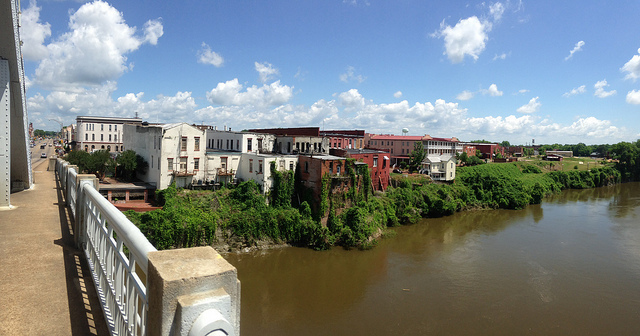 I think in my 10 weeks here, I have probably only scratched the surface of all that Selma has to offer. And that’s the way it should be. To truly understand a community, you shouldn’t be able to gain the necessary knowledge in 10 weeks. It takes years of ups and downs, crises and celebrations to really know and be a part of a community. So, I suppose, if Living Democracy is like swimming, and Selma is like a pool, I’ve managed to tread water, doggy paddle at the most. I’m no Michael Phelps, but if we are measuring who learned the most from their experience this summer, I bet I’d win the gold. Inspired by the 133rd Psalm, the Exchange Club operates by this motto. 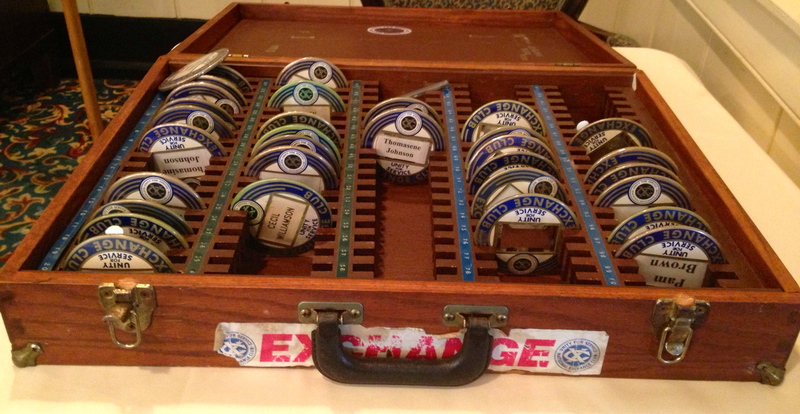 Two years removed from its centennial anniversary in 2011, the Exchange Club stands at 21,000 strong with more than 700 chapters all over the United States and Puerto Rico. 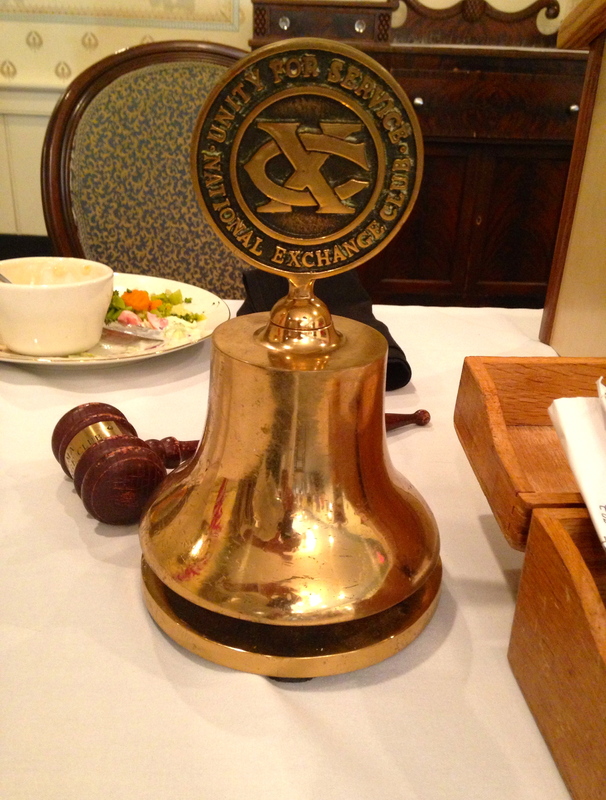 Founded in Detroit at a luncheon gathering by a group of businessmen who wanted to “exchange” ideas, the Exchange Club continues to be an organization in which members are encouraged to bring their respective talents and interests together to accomplish goals in the community. 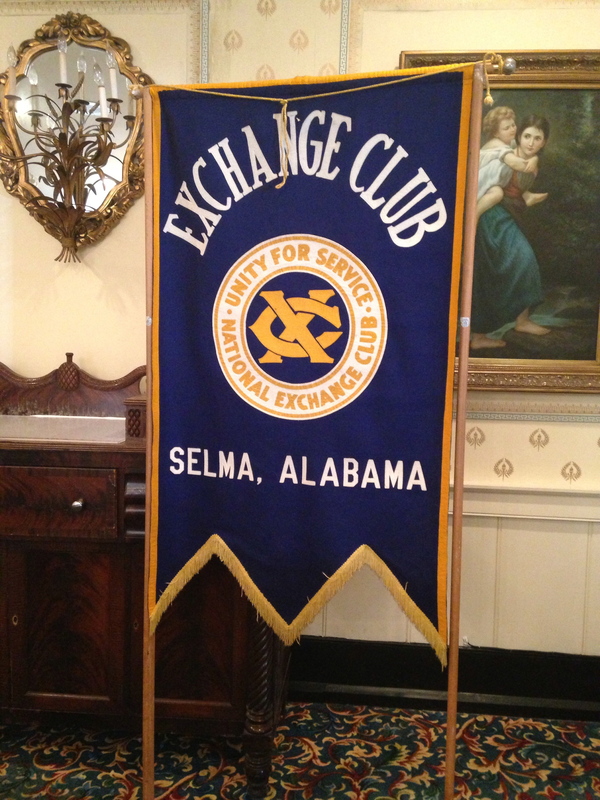 Selma’s chapter of the club meets at the St. James Hotel every Wednesday and has its gatherings over lunch. Motivated by the club’s three core values of Family, Community and Country, Selma’s Exchange Club places its focus on projects that improve these three areas. Selma’s Exchange has new leadership in command and a renewed desire to make a positive impact on the community. The club has a history of receiving national awards for its projects, and the desire to repeatedly meet these goals continues into the present. Most of the awards focus on the number of projects undertaken by the Club, but some have the added caveat of recognizing the group for increasing membership. Maintaining members in a time when many are too busy to be active in activities outside of work and family has proven to be a difficult for civic organizations across the board, but the Exchange Club here has made it a goal not only to maintain the current membership, but also grow it. With multiple civic organizations in the area, joint members are welcomed and encouraged to participate. 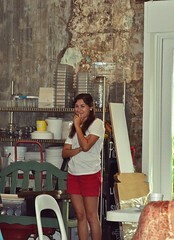 The members are now assessing the viability of existing projects and looking for new opportunities. 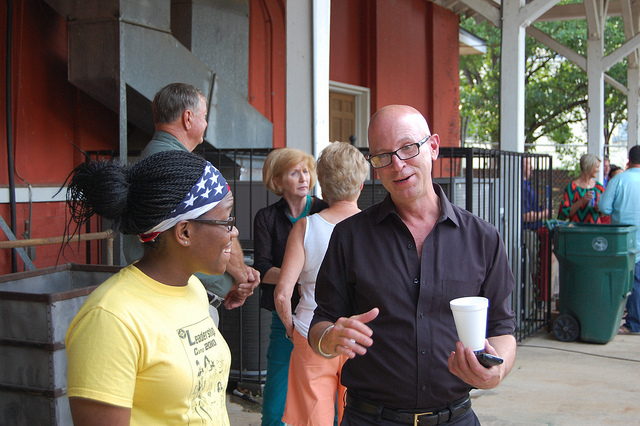 The projects that the Selma Exchange Club undertakes generally fall under one of their Four Pillars of Americanism, Youth Programs, Community Service and Child Abuse Prevention. Projects under discussion include passing out flags at patriotic celebrations and honoring a local law officer or firefighter with periodic awards for their service. Freedom Shrines are a way for the Exchange Club to give local citizens, especially youth, “proof that the freedom and greatness we enjoy today were not purchased easily.” The displayed documents are intended to remind citizens of gifts that should be cherished and protected. The Selma area currently has at least 12 Freedom Shrines in varying locations, including schools and in the Selma Mall. Rededicating current shrines and dedicating new ones is a goal of every Exchange Club, with the eventual goal being to have a shrine in every junior and senior high school in the nation. 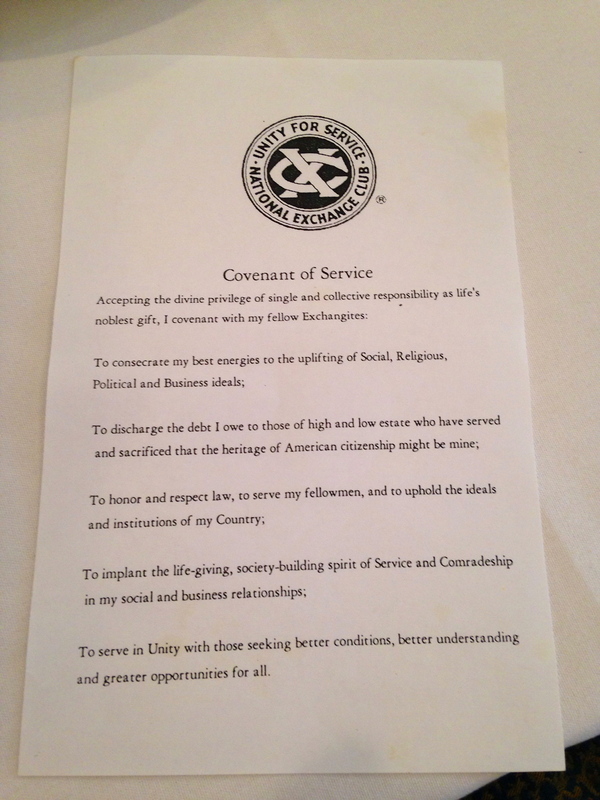 The group also supports the Book of Golden Deeds Award. The National Exchange Club’s longest running project, the Book of Golden Deeds Award recognizes community members who volunteer above and beyond to make their communities better places. This year’s recipient was Howard Tinsley, a local Exchange Club member of more than 27 years. A 22-year military veteran and longtime American Red Cross member, Tinsley has been serving the community in various capacities for many years. Present at the recent awards ceremony were many of the past Book of Golden Deeds Award recipients, including AU Living Democracy Community Partner Sheryl Smedley. In a society where negative headlines get more attention than positive ones, Selma’s Exchange Club continues to do positive work in the community. Its members show dedication and a desire to better their community, and that is all that can be asked of any civic organization. They have a strong commitment to family, community and country, and it is organizations like Exchange Club that will continue to create and utilize engaged citizens, wherever they may be. If “we” keep working together in Selma, you may soon be able to say “oui” at a French restaurant proposed by Selma youth. 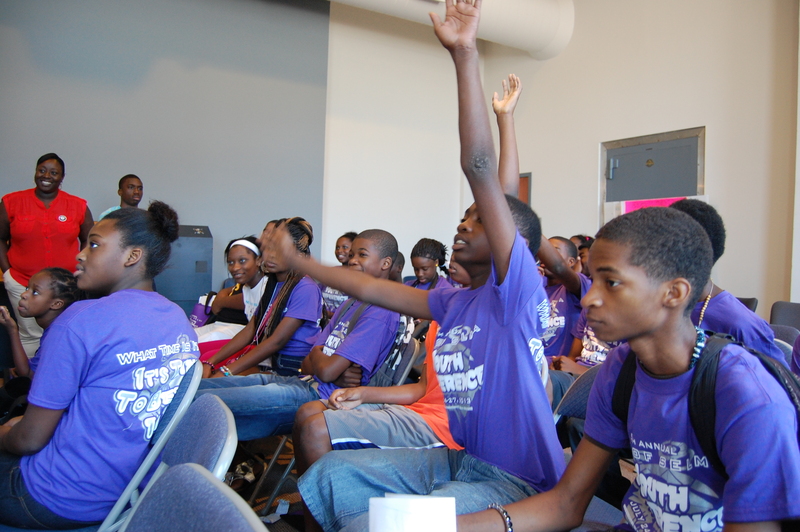 Wearing t-shirts that ask on the back “What time is it?” and answer “It’s time to believe in me!,” the fifth annual Selma Youth Conference brought together students of all ages July 25 and 26 for hours of teambuilding, skilled learning and the reminder that education is always key to bettering oneself. In just two hours over two days, Living Democracy Fellow Taryn Wilson was able to get approximately 30 students participating in the conference thinking in the entrepreneurial business mindset of planning, debating and creating. The atmosphere of the camp was intellectually festive, like a celebration of learning. Even though they were required to think critically and produce work, the ability for the students to socialize and exchange ideas meant more smiles and more creativity. The students split into six loose groups and were given markers and a large sheet of paper to draw up a plan for a business. 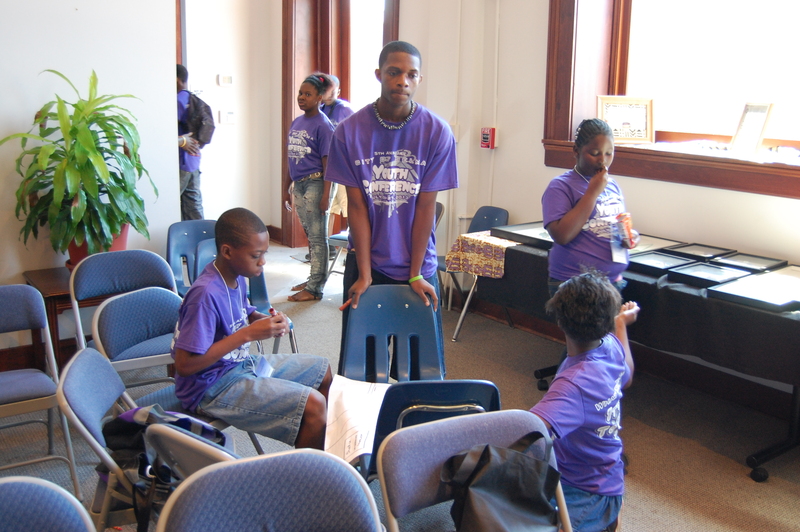 On the second day of the conference held at the Selma Interpretive Center, students finished their plans and made presentations to their peers. Some were creative and highly ambitious, like a French restaurant (Cherie L’lori) to be headquartered in Rio de Janeiro and a new line of shoes (brand name: G-T3CH) with a built-in television. Other teams stayed in the realm of practicality. One group proposed a paper mill located in Selma that sold glow-in-the-dark paper, something many might think could actually be quite popular with college students and late-night independent thinkers. 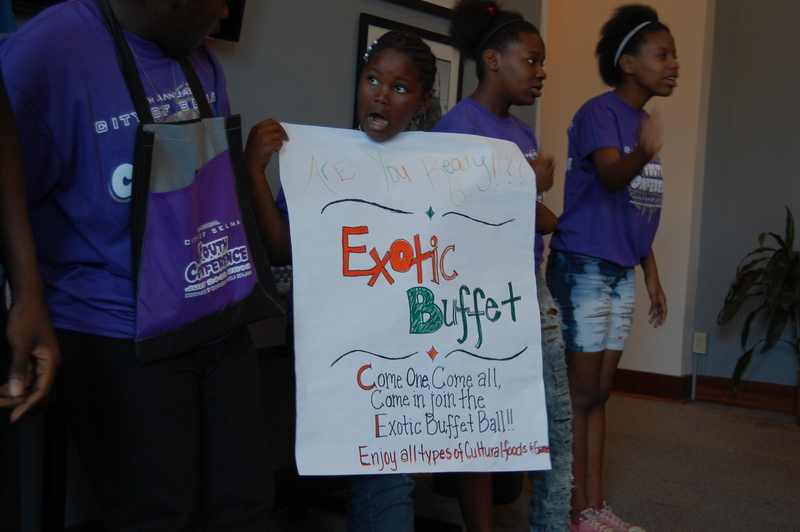 An exotic buffet that would serve food and showcase culture from many different parts of the world was also pitched as an idea. During the sessions, Wilson set no guidelines about how the students were able to plan out their businesses, and she was pleasantly surprised at how thought out even some of the more fantastic ideas were. 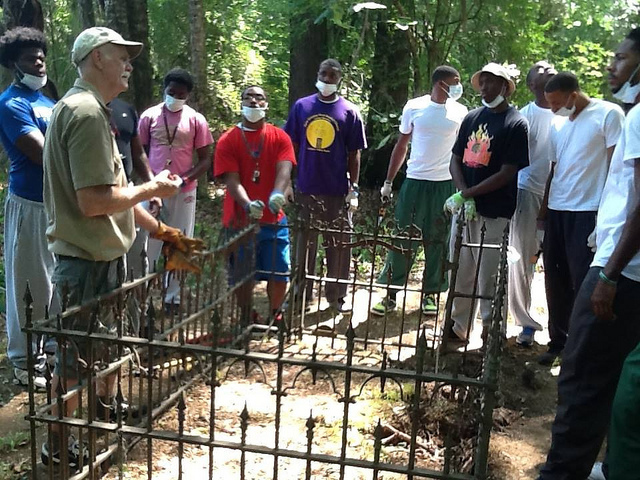 Participants in Concordia College’s ABC program help clean up historic site at Old Cahawba. In 1970, if you said “ABC” someone would surely respond, “Easy as 1-2-3!” The Jackson 5 found widespread success with that and many other songs that year and became a household name. However, if you said “ABC” around Concordia College Alabama during the summer, “easy” is not a word that would come to mind. Academic Boot Camp, or ABC Camp as it’s commonly called, is a month-long program sponsored by Concordia College’s Man Center. The program is designed to give incoming male freshmen students the opportunity to come take introductory classes and begin to get adjusted to college life before the fall semester begins. 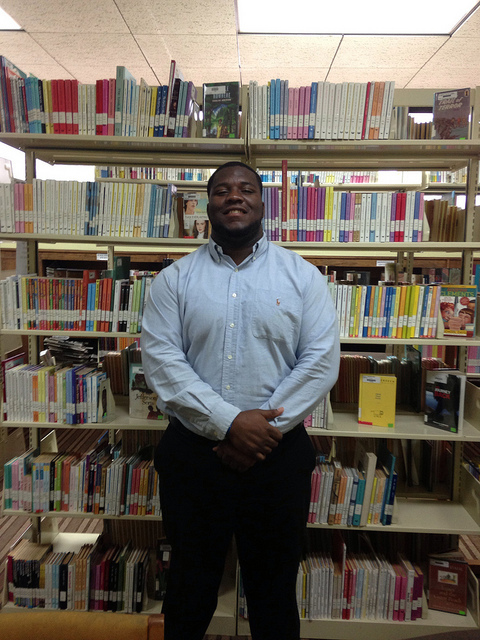 Head mentor Jamal Kidd helps inspire academic, community goals. A part of the school’s Quality Enhancement Plan, the Man Center puts on this ABC Camp to “prepare male students, especially first-time freshmen, to be competitive in all areas of life and provide a Christ-centered learning environment which assists males, especially first-time freshmen, in identifying spiritual, moral, and ethical directions and academic success.” A program created in compliance with the Southern Association of Colleges and Schools (SACS) requirement for some sort of Quality Enhancement Plan for accreditation, the Man Center focuses on instilling all who participate with their five main tenets: learning to lead, learning to work, learning to serve, learning to teach and learning to learn. 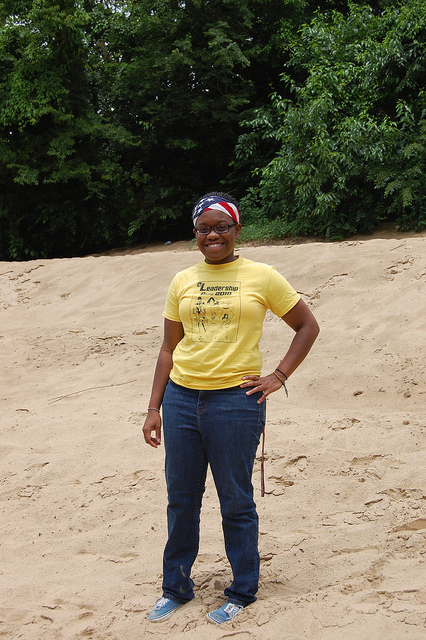 This summer, with more than 30 participants, Camp Coordinator Oronde Walker is focusing on making this group of students a cut above the rest. “I want them to stand out and be responsible distinguished young men, and be good role models,” Walker said. With adherence to a rigorous daily schedule, Coach Walker has ensured that it will be a challenging journey. On a given weekday, the students, most of who have been recruited to play for the football team, wake up at 4:30 a.m. to work out. Then they have time to shower before heading to breakfast. After breakfast follows a day jam packed with academics, with the students taking Orientation to College, Microcomputer Applications and Fitness and Health at some point over the course of the day. After the classes, more academics follow with tutoring in either math or English. Dinner and activity time follow tutoring, with the activities generally consisting of team sports where the guys can show off some of their athletic abilities. Prior to lights out, the students have something called “Power Hour” led by their upperclassmen mentors who accompany them through their daily activities. “Power Hour” is a time set aside for the mentors, who are usually responsible for four to five students, to talk to their students about their day and anything that they have going on at the camp or at home. Mentors use this time to get close with the mentees and create a relationship in which trust and respect are cultivated between the members of the small groups. Only lights out follows Power Hour, and as you might imagine, sleep is more than welcomed by the worn-out students. As a departure from the daily workload that they endure, on Fridays the students leave campus and do community service around the Selma area. Learning to serve is one of the main focuses of the program, and getting students out into the city achieves that goal while allowing the students to become involved and engaged in the community that they will call home for the next four years. “It’s important for our students to learn early in their college experience that community service is an integral part of their growth as future leader,” Walker said. 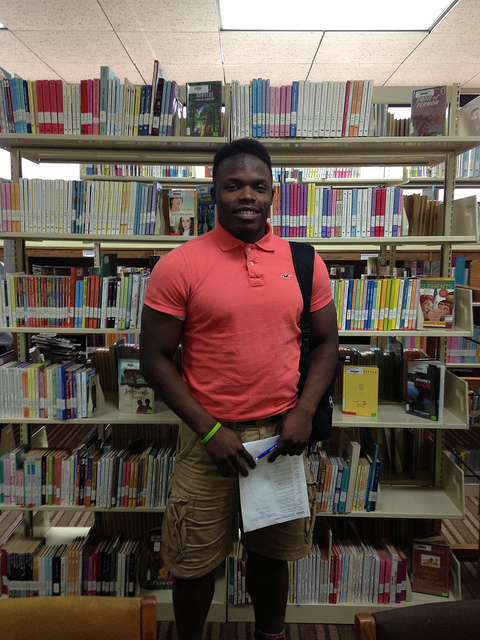 ABC student Joshua Bell enjoys community service, field trips. Additionally, the students took trips to the National Civil Rights Museum in Memphis and to a Montgomery Biscuits baseball game as rewards for their hard work in the classroom. Student participants Shon-Marc Lewis, Corey Fox and Joshua Bell spoke about the impact visiting Memphis had on them, especially seeing Martin Luther King Jr.’s room at the Lorraine Motel, the location where he was fatally shot in 1968. When asked what the best part of the summer experience was, all three agreed that learning how to come together and communicate with others and manage themselves personally were things that would be of value to them for the rest of their lives. When asked what was most difficult their response was the same, with Shon-Marc elaborating that “understanding that everyone has a different mindset and outlook, and learning how to talk to people who take things differently than you” were the two most difficult challenges. With the amount of change that Coach Walker, the mentors and the staff have made in the few short weeks that they’ve worked with the students, I can only imagine how Concordia College Alabama will benefit from continuing to grow and mold these students into young men over the course of their education. Coming from areas all over the South, these students will not only make a change in Selma, but also in their hometowns and communities as they return home for the last month of summer break carrying themselves differently than when they left. And though the process may have been difficult and challenging, the program has equipped these students to make a much smoother transition into college life this August. You could almost say it’s going to be easy as 1-2-3.